"Go to the right places in the Algarve at the right times of year, and the most amazing orchid sights will greet you. This beautifully illustrated book answers those crucial questions What, Where and When..."
A beautifully illustrated souvenir guide to wild orchids in the Algarve, Portugal's wildflower paradise. More than 100 large colour photographs. Details of dozens of the Algarve's amazing wild orchids and their habitats. Special features include 'where and when to look' advice plus a site location map, details of the Algarve's nature reserves and other orchid-rich walks. Buy your author-signed copy now for just £6-50 + P&P using your Credit Card, Debit Card or, if you have one, your PayPal Account all available via the secure on-line PayPal system. Pay with your Credit Card, Debit Card or PayPal Account, all accepted via the secure on-line PayPal system.You do not need a PayPal account to pay using your credit or debit card. Once you click "Buy Now" you will be redirected to PayPal for payment with a Check Out by PayPal option (orange button) and below it a further Check Out option (white button) to pay with a Credit Card or Debit Card if you do not have a PayPal account. Important note: you do not need a PayPal account to buy books online here, because the PayPal checkout system also provides the option of paying with your credit or debit card. Published October 2009. A beautifully illustrated souvenir guide to wild orchids in the Algarve. Sue Parker is a frequent contributor to countryside magazines, radio and TV programmes and has been photographing wild orchids for more than 30 years; this is Sue's ninth book. Sue Parker's passion for wild orchids dates back to her childhood in the Far East, where epiphytic orchids grew on the fence at the bottom of her garden, and the tropical countryside abounded with orchids as well as many other beautiful exotic flowers. 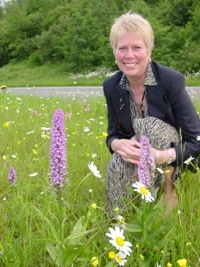 To date Sue has written nine books about wildflowers, including four that are devoted to terrestrial orchids. Apart from Wild Orchids in the Algarve, Sue has also written Wild Orchids of Wales, how, when and where to find them, and Wild Orchids in The Burren (the latter being co-authored with her husband Pat O'Reilly). Sue's latest book for the Algarve region of Portugal, Wild Orchids of the Algarve, how, when and where to find them, is an acclaimed comprehensive hardback field guide - indispensable for anyone with a keen interest in Europe's wild terrestrial orchids. Sue has also made radio and television programmes about orchids and continues to give talks and contribute articles to countryside magazines.